The following is a two-part series on the role cruisers played in the Soviet and Russian Navy. The first part examined historical inspiration for developing a cruiser-focused force, concepts of employment, and strategic rationale. Part II will focus on how cruisers shaped the environment through forward presence during the Cold War, and how the nature of presence may evolve into the future. It was not of course all about the cruisers. Even with two ‘levels’ of construction the Soviets would not have been able to devote enough resources to the construction of cruisers to sustain the number of hulls required to maintain the level of visibility that is a requisite of presence. In simple terms they hit the same problem the Royal Navy (RN) of the 1920s faced. The pre-WWI Fisher reforms sold off all the old ships which had been used as presence vessels2 – in the phraseology of that period, gunboats,3 so what to build as new build vessel for presence? What reveals more is the theater the visits were focused on: 69 went to the Indian Ocean –the highest number. Of these visits though, 29 took place during a two-year period, 1968-9, while the Soviet Navy was settling on which Indian Ocean ports to use as either a primary or secondary operational hub to support the Indian Ocean Squadron (the second forward deployed squadron the Soviet Union created), in the region.12 These visits were arguably more about testing the port facilities of allies, although they were also important for presence. In the retreating colonial atmosphere where the traditional power, Britain, was withdrawing and the new powers, America and the Soviet Union, were still integrating themselves – these visits served to foster relationships and grow connections. 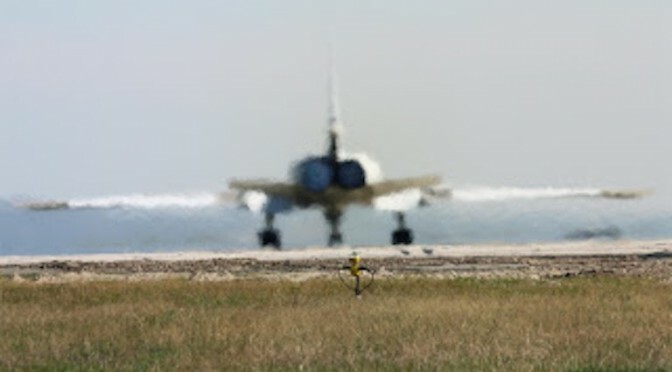 The second largest was the Atlantic, followed by the Mediterranean (which was the home of the first Soviet Union forward deployed squadron), and then the Pacific.13 The visits were very much focused at the ‘southern flank,’ and nations which belonged to NATO. They served to highlight the reach and capability of the Soviet Union to these nations in a very visible and of course ‘peaceful’ way. Alongside the visibility of presence gained from port visits, these visits also provided the opportunity to build relationships and gather human as well as electronic intelligence. 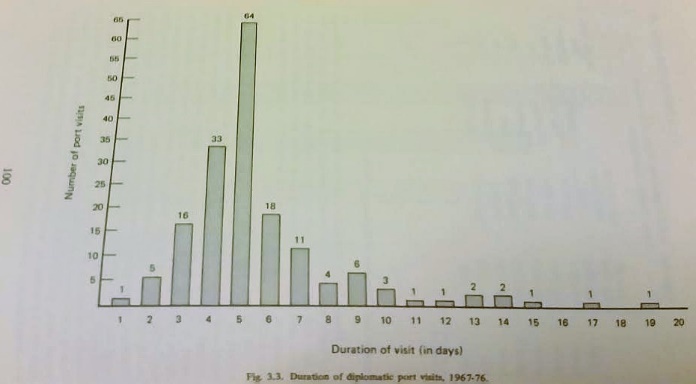 Whilst of course this is true of both the visitor and host, the initiation of the visit by the visitor, and rules of diplomatic etiquette (if followed by both sides), will usually serve to give the visitor an edge. This can be crucial in providing knowledge to the capability and capacity (i.e. how many ships/units can be actually made available at any time for operations) of potential opponents and allies. Electronic intelligence and human intelligence are factors which are widely discussed,15 but still need to be highlighted. Even a ship outfitted with a moderately capable Command, Control, and Communication (C3) setup can provide significant listening capability whilst just passing through an ocean. Many nations put in far more basic equipment. This variance in electronic equipment outfit can often be a significant explanation as to the cost differences between procurements of similar vessels for different countries. These passive sensors are nothing though compared to the turning on of more active sensor systems as both capability sets provide governments with the ability of proactively observing events within an area so that they have as much and as accurate information as possible. This capacity, when combined with the relationships that are built by ongoing diplomatic and military interaction, can provide interested nations with the ability to more accurately predict the possibility, as well as take advantage, of events or opportunities. 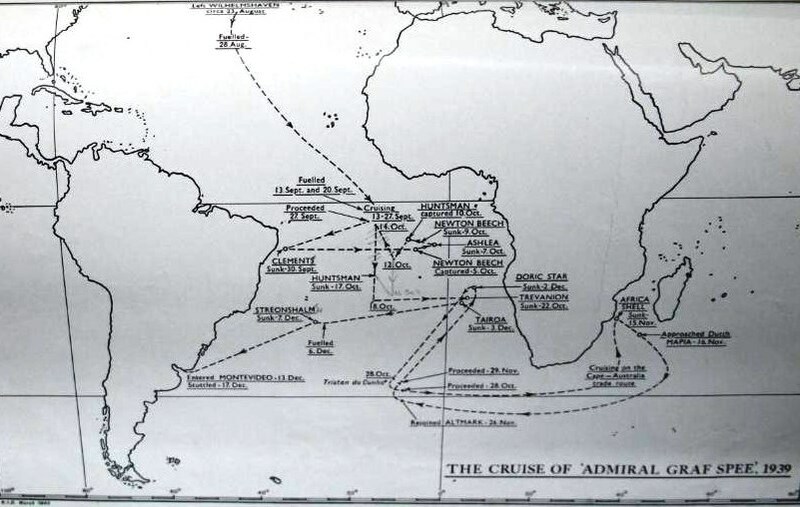 The presence of the ships combined with the airlift of mainly Cuban military personnel and Soviet equipment for which those ships provided cover secured the installation of the Popular Movement for the Liberation of Angola (MPLA) in power, rather than the American- or Chinese-backed organisations.18 While the warships never directly took part in combat operations, their presence allowed the Soviets to keep a very close eye on the situation. This success is the capability which presence is an auger for. The vessel that is seen serves as a symbol and warning for all the force that might be dispatched. While there, the ships can provide more tangible benefits in terms of gathering intelligence and building relationships which could make a larger deployment unnecessary. If such larger deployments do become necessary, the information already gathered enables governments to refine and focus any such deployment to achieve the aims they desire more effectively and efficiently. These successes were ultimately why the Soviet Navy eventually chose to procure aircraft carriers, as well as cruisers.19 It was not the pursuit of German-style ‘Risk Fleet’ strategy,20 but a realization that adding another level of presence would give them more diplomatic and operational flexibility. With the addition of aircraft carriers to its cruiser force the Soviet government was able to maintain ongoing presence within regions and raise the level of commitment if warranted, but always building upon the foundation of presence that was the ongoing feature of their policy. It was their ability to magnify the presence of Soviet forces by the addition of an organic sea-based fixed-wing component (giving the options for overflight, like the British achieved in Belize/British Honduras vs Guatemala with the Ark Royal in 197221) that was their peacetime selling point. The primary question that will undoubtedly feature in future presence discussions is whether manned or unmanned systems are better value for money. Whilst those who are budget-minded will no doubt seek to replace manned with the unmanned, in reality the more sensible idea would be to consider the lessons of the past, and perhaps even the principle foundation of presence itself. It is a standard of presence that the small vessel that is seen is an active emblem for the far larger fleet that can be sent. This idea has been built upon. Helicopters have been used along with a detachment of marines/infantry to give an impression that a far larger ground force was available – as well as demonstrating their ability to appear anywhere. From all of this, there is therefore a successful precedent, whereby smaller/lower presence units are used to magnify the presence/area of effect of a higher impact unit. This is most likely to be the best option for unmanned systems, that they be part of a larger manned system or work in tandem with one so that the human side of presence is involved, while the unmanned aerial and surface systems would serve to magnify its impact. It is as such a probability that the utility of small vessels for presence effect missions will grow; yet they will always depend, as the Russians and Soviets demonstrated, upon the strength of will encapsulated in their orders, the quality of their crew, and the foundation provided by the capable vessels they represent. This could be a basis for the promulgation of a two tier naval force, one with a strong core of warfighting vessels (aircraft carriers, destroyers, amphibious ships and submarines) kept at a high level of training and readiness, but which are deployed rarely – except to the most dangerous areas that require something more. The second tier would be a larger number of presence/flotilla vessels, which would be almost continually forward deployed to show the flag, provide maritime security, and demonstrate interest around the world.24 Such an idea is not new:25 in fact it was the foundation of Soviet naval diplomacy and of the British Empire’s maritime policy for most of the 19th, and early 20th centuries. However, in an age where the complexity and advanced technology of weapons systems (and warships in particular) seems to be a major selling point for their procurement, such a premise may be difficult to sell. Many countries possess both a Coast Guard and a Navy, and in the case of the U.S., the size, level of armament, and general sophistication of the Coast Guard cutters means that they are in many ways just as useful as USN ships in providing presence. This is not the case with most nations, but Britain as a nation which has a longstanding maritime history is an example of this. In fact, Britain possesses not only a Coast Guard, but also a Border Force; both of which operate ships. Although the vessels are capable in localized maritime constabulary roles (and two of the Border Force vessels were deployed with HMS Bulwark to help with the 2015 Mediterranean Crisis26) – they are not as capable in the presence role as the River-class OPVs or minesweepers the RN currently uses for its small ship missions. This does not mean though these Coast Guard and Border Force ships are not useful, just that they cannot be considered interchangeable with the RN ships. The British Government, which is currently procuring three more River-class vessels27 and has made an announcement to procure two further vessels, might wish to look again at the this very useful and adaptable class and see what more can be achieved from its design or could be gained by further increasing numbers in a presence context. Presence matters. Events are decided by those who care enough to show up28 – not by those who sit back on the sidelines. The Soviet Navy, and to a large extent the modern Russian Navy, was not built on its wartime missions; but rather its peacetime roles – in contrast to Western navies that have prioritized warfighting constructs. This focus is understandable when considering the constricting budgets these navies face and requirements that war would undoubtedly place on them. However, while the last year that British forces were not in action was 1968, wars which require naval forces to do more than support land forces are not that common – in fact the 1982 Falklands War was it for Britain. This does not mean the capabilities are not needed, as when they are needed they are really needed; but it does mean that in order to justify themselves navies need to be more engaged with peacetime possibilities and roles. They need to be engaged with the full role of the cruiser, the peacetime ambassador and bobby on the beat, and the warrior. Lack of focus on peacetime roles weakens navies in the political sense, as in a democracy the leaders respond to the public and media, who in turn largely respond to what is most visible, most immediate – not having the time to really consider the long term before the next thing comes along. This weakness was of course less of a problem for the Soviet Navy, and to an extent the Russian Navy, which has to impress a small number of stakeholders. Western navies however need to be in the public debate in order to justify the expense, whether it is for warfighting or for peacetime. This is not because democratic governments do not care about defense, but because the nature of democracy means that that the more visible the department of government, the more it shows its relevance to the public and the harder it is to cut. The Soviet Navy (admittedly working in a less democratic national governance model) managed to build a fleet for war by mastering and building recognition from the missions of peacetime. This is not to say that western navies need to build flotilla vessels, although they could be useful as presence and force multipliers;29 the Soviets went down that route as an offset strategy. For the carrier-centered western navies, whilst a small increase in major surface combatants would no doubt be of use to provide flexibility of presence; for pure presence missions, vessels of OPV or corvette size would be more appropriate. These vessels are often cheaper, and as with the Soviet choice of cruisers in the Cold War, would not carry the risk of provoking an arms race, and would provide the hulls necessary for nations to have presence where they need it to be. This is important, because if countries wish to be actors more often than reactors, they need to have as accurate as possible understanding of what is going on and be able to act quickly. A small ship may not have the status of a larger vessel, but its presence as the vanguard of the larger can enable it to have an impact out of all proportion.30 Events which are caught early can often be resolved more quickly by what is already there – thus according the situation less possibility for escalation. Presence can serve to increase predictability and stability which are always good for helping to maintain peace. Dr. Clarke graduated with a PhD in War Studies from KCL in 2014, the thesis of which focused upon the Royal Navy’s development of naval aviation and aircraft carrier design in the 1920s and 1930s. He was supervised during this by Professor Andrew Lambert. Alongside this he has published works on the 1950s with British Naval History, and has also published on current events with European Geostrategy and the Telegraph online as part of the KCL Big Question series. He has maintained an interest in digital history, and is organizing, hosting, and editing a series of Falklands War veterans interviews for the Center for International Maritime Security and Phoenix Think Tank. Recent research outputs include presenting a paper at the National Maritime Museum’s 2016 conference on the ASW capabilities of the RNAS in WWI, and will be presenting a paper on the design & performance of Tribal Class Destroyers in WWII at the forthcoming BCMH (of which he is a member) New Researchers Conference. TNA: ADM 1/8672/227. 1924. “Light-Cruisers Emergency Construnction Progrmme.” Admiralty 1/8672/227. London: United Kingdom National Archives(Kew). TNA: ADM 116/4109. 1940. “Battle of the River Plate: reports from Admiral Commanding and from HM Ships Ajax, Achilles and Exeter.” Admiralty 116/4109. London: United Kingdom National Archives (Kew). TNA: ADM 116/4320. 1941. “Battle of the River Plate: British views on German pocket battleship Admiral Graf Spee in Montevideo harbour; visits to South America by HMS Ajax and HMS Achilles.” ADM 116/4320. London: United Kingdom National Archives (Kew). TNA: ADM 116/4470. 1940. “Battle of the River Plate: messages and Foreign Office telegrams.” ADM 116/4470. London: United Kingdom National Archives (Kew). TNA: ADM 223/714. 1959. “Translation of the 1949 Russian Book “Some Results of the Cruiser Operations of the German Fleet” by L. M. Eremeev – translated and distributed by RN Intelligence.” ADM 223/714. London: United Kingdom National Archives(Kew), 02 September. TNA: ADM 239/533. 1960. “Supplementary Naval Intelligence Papers relation to Soviet & European Satellite Navies: Soviet Cruisers.” ADM 239/533. London: United Kingdom, National Archives (Kew), November. TNA: ADM 239/821. 1959. “Particulars of Foreign War Vessels Volume 1: Soviet & European Satelite Navies.” ADM 239/821. London: United Kingdom National Archives (Kew), January. TNA: DEFE 6/51/104. 1958. “Requirement for Cruisers East of Suez.” DEFE 6/51/104. London: United Kingdom National Archvies (Kew), 21 August. TNA: FO 371/106559. 1953. “Soviet ships off the Shetlands; visit of Soviet cruiser Sverdlov to Spithead for the Coronation. Code NS file 1211.” FO 371/106559. London: United Kingdom National Archives(Kew). TNA: PREM 11/1014. 1955. “Reconnaissance of Soviet cruisers by HMS Wave and RAF aircraft.” PREM 11/1014. London: United Kingdom National Archives(Kew). The following is a two-part series on the role cruisers played in the Soviet and Russian Navy. The first part examines historical inspiration for developing a cruiser-focused force, concepts of employment, and strategic rationale. Part II will focus on how cruisers shaped the environment through forward presence during the Cold War, and how the nature of presence may evolve into the future. This is an often quoted phrase of Britain’s 17th Century Lord Protector Oliver Cromwell;1 a phrase stated in an age when seapower had shown promise of potential,2 but not yet attained the capabilities, or achieved the feats, that would truly make it demonstratively so.3 This words were said before the ministry of William Pitt (the Younger, Prime Minister 1783-1801 & 1804-6),4 before the works of Alfred Thayer Mahan5 and Julian Stafford Corbett6 were published, and before the age of Empire and Gunboat Diplomacy.7 Yet still, in just eight simple words, it sums up the root construct of all this history and thought that have, does, and will continue to shape the world and relations between states to this day. It does this because it succinctly sums up a principle function, and duty, of warships in ‘peacetime.’ A function, which is entirely entwined with navies’ roles of maintaining maritime security8 – enabling freedom of trade, as well as access to the bounty of the sea, and presence,9 the protection of interests, reassurance of allies, and deterrence of potential aggressors. Maritime Security and Presence are big missions for navies, they are the roles of ‘peacetime’ which make ‘peace’ such a relative term for navies in comparison to armies.10 A situation accelerated by the fact that in ‘peacetime’ the rules of engagement become by necessity stricter, the constabulary duties (fishery protection, counter piracy, counter smuggling, etc.) get greater focus, and engagements with other nations, both friend or potential foe, become more nuanced and subjective. This though is nothing new, and despite the recent phraseological development of the ‘Oceanic Global Commons,’11 patrolling the world’s original super highway – the sea,12 has been the subject of discussion and debate probably since humans first set to sea. The best lesson that has been drawn from these discussions, is that there is always more to be learned. So with the discussion started, it is necessary to explain the question, why focus on the Soviet, and successor Russian navy? That is explained by the fact that while the Soviets and the Russians have never achieved dominant status at sea, they have successfully managed to enhance their status, maximize their presence, and achieve a growing level of influence through leveraging the capability they had/have in ways that have limited other nations ability to interfere with their interests. This success has not been achieved by accident, instead it is a product of long running analysis;13 analysis which has diverged at a significant point from the traditional Anglo-American Western naval model14 – not through a different understanding of warfighting, but a different perspective on operations outside of warfighting. As students of history the Soviets had seen how a land power, Germany, had not really gained anything, but lost a lot strategically by building a fleet which was shaped directly to challenge the largest sea power prior to WWI15 – conversely the same nation had got far closer to success with a more asymmetric approach both in that war and WWII. The prime example of this is a weapon of sea denial, the submarine. Unfortunately, the experience of both WWI and WWII showed that submarines alone were not enough in war time; furthermore, it showed they are only really useful in wartime. In ‘peacetime’ they are good for intelligence gathering, Special Forces operations, and practicing for war. Submarines are so limited in conducting presence operations because they are by their very nature stealth units, and the visibility required for presence goes against this fundamental attribute. Furthermore, due to the physical and technological sensitivity of their hull coats and sonic signatures, even port visits to the closest of allies are fraught with potential risks that are more sensibly avoided. The use of submarines in the presence mission, therefore usually comes at the point of it becoming focused towards ‘conventional’ deterrence16 – rather than just overt presence. This is where surface combatants come in, and it explains the evolving Russian approach with a growing focus on designs which were far more general purpose than specialists despite their often stated role of Anti-Submarine Warfare.17 No area is this seen more clearly than in the consistent focus on cruisers, and the ‘cruising mission.’18 Understanding the difference is something which will begin to matter more, not only because of the resurgent Russia, but the growth of other navies, for example China and India. 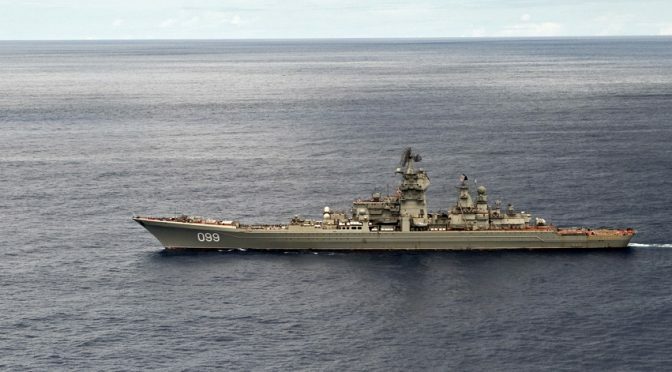 These nations have not merely acquired equipment, they also draw heavily from the Russian (and by extension, Soviet) naval experience and practice in conceptualizing naval operations. 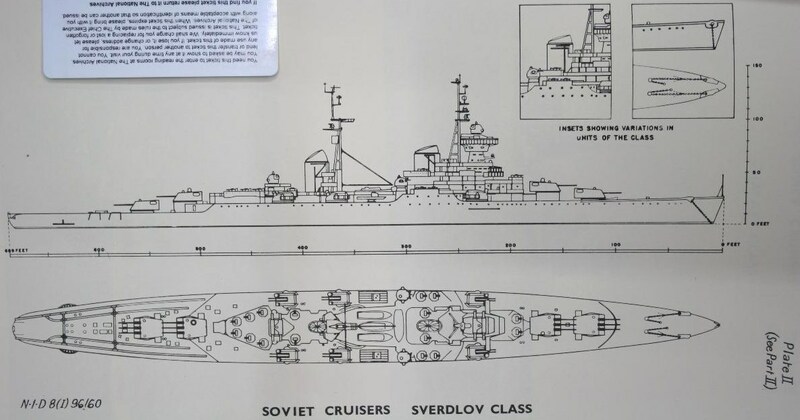 The post-WWII Sverdlov class19 was where the Soviet navy started to bring their vision of cruiser capability to fruition. Pre-war plans had been very conventional and these post-war plans were heavily influenced by their understanding of WWII German naval surface raider operations.20 These operations had tied down large amounts of Royal Navy (RN) combatants, and had been very successful. For example the cruise of the ‘Pocket’ Battleship, the Admiral Graf Spee, whilst ending heroically (for both sides21) at the Battle of the River Plate,22 had sunk nine merchant ships, captured two ships, and ‘frightened’ at least one other. Although these are the easily measurable effects, there is no real way of quantifying how many Captains changed or altered their course, how many loads were late or connections missed, all as a result of the fear of where the German raider was – or just as strong, the fear of where it might be. In any case, the effects were not limited to the merchant marine. According to the Soviet Historian L.M. Eremeev23 in his work Some Results of the Cruiser Operations of the German Fleet, the RN mobilized numerous forces to catch the Admiral Graf Spee, including Commodore Harwood’s South Atlantic Squadron, seven cruisers, two aircraft carriers, a battlecruiser, and at least three destroyers (although considering the escorts required by the capital ships mobilized, he was likely underestimating this number by a long way). This demonstrated to the Soviet Union the potential of surface ships, if used in a ‘cruiser warfare’ manner, to exert great impact upon operations disproportionate to the realistic capabilities of the vessel. Maximum benefit was sought from every rouble of the naval budget30 by making the most of unit presence for peacetime missions and multiplication of assets to make any opponent’s attempts to use the sea as complex as possible.31 Warfighting was about sea denial, raiding, and the tying down of enemy forces while simultaneously making their movement difficult.32 Peacetime was for building relationships, strengthening alliances, for stretching muscles, gaining experience, and hindering other actors such as Britain and the United States in their attempts to shape the world whilst simultaneously seeking to shape it themselves.33 The 1950s Sverdlovs were not though the only class of ship built by the Soviets that would fit into this mould. 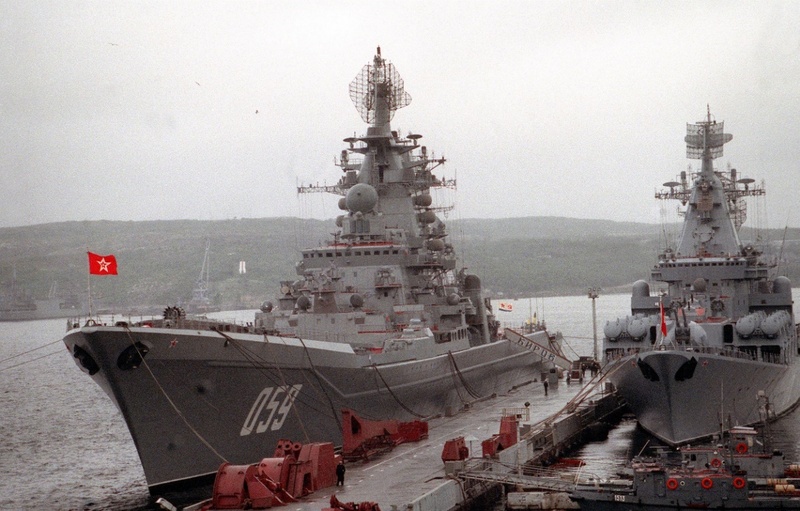 They were more the beginning of a story, which would continue into the 1970s with the Slava-class, Kara-class,34 and the behemoth 28,000 ton Kirov-class ‘Battlecruisers.’35 Alongside these vessels were other cruiser designs, less capable in terms of combat and command, but still with comparable status, size and armament of cruisers;36 just as large a statement of intent and capability. This capability was different from western navies, as it was not built upon the warfighting prowess of aircraft carriers. The cruiser-centered force better suited the strategic vision and peacetime presence mission profile for the Soviet Union better than any other available option. The advantages were that cruisers are cheaper and easier to build and operate than aircraft carriers, can physically enter more ports to support diplomacy, and while being lesser in range of combat power than aircraft carriers were not necessarily lesser in combat capability within that more limited scope. This made them powerful tools for a nation which was seeking to flex its muscles around the world as a method of spreading its influence but not foment a naval arms race in the way that it was already in a strategic arms race.39 The Soviets realized that aircraft carriers, like Germany’s pre-WWI dreadnought battleships,40 would be seen as provocation and direct challenge. Cruisers were enough of challenge to be status worthy, but did not represent a direct confrontation of the carrier-centric NATO navies41 – therefore, would not be a direct attack on their confidence and thus a provocation. This is a policy though which did not stop with the end of the Cold War; in fact modern Russia has gone to great lengths to continue it. 10. Air forces, as has been highlighted recently also experience issues – with other nations probing air space; but still they do not face potential problems on the scale or diversity that navies could experience, especially navies belonging to nations with far flung territories strewn around the globe. 14. Sergey Gorshkov (1980, p.230) goes into great detail as to the diference between the idea of dominance at sea adopted by Russian in comparison to England, and America which had inherited the English model. 15. Massie (2005) – a conclusion which is further supported by the experience of Japan in WWII, it had also chosen to build a scaled battlefleet, and whilst with its challenges this did make some sense – its lack of infrastructure to support a rapid expansion of its fleet to equivalent levels meant that although it suited the cultural/political perception of its national leaders, it was not necessarily as sensible as a less conventional fleet structure might have been (Stille, The Imperial Japanese Navy in the Pacific War 2014). 17. Polmar (1991), and TNA: ADM 239/821 (1959), both highlight how often ships with very capable surface-to-surface and surface-to-air weaponry, for example the Kara Class (Polmar (1991), pp.155-7) are described as ASW Guided Missile Cruisers, yet both their SA-N-3 Anti-Aircraft missiles, and SS-N-14 anti-submairne missiles, had significant anti-ship capability (especially the latter, which being torpedos at their terminal stage are arguably more dangerous than a pure missile system)…furthermore as the class was built, one of the class, Azov, had it’s air-defence upgraded to include the far better SA-N-6 (which also has an anti-ship capability), and all of the class were built with extenseive command and control facilities. 39. Rohwer & Monakov (2006), illustrates this in their work by highlight how many grandiose naval schemes were planned, and enver completed; when if the will had been present, and decision had been made, then the Soviets under Stalin could have allocated the resources to do it. 43. 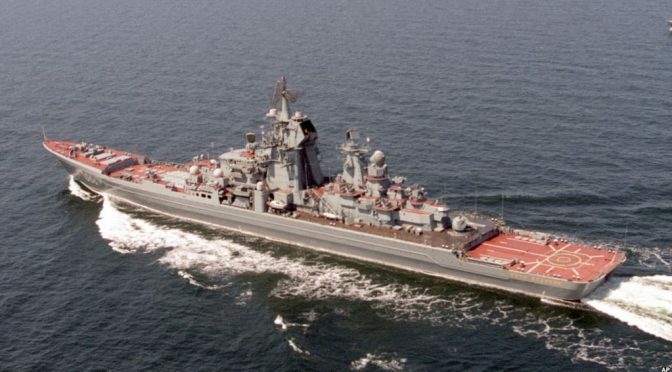 Janes (2006), or for those wanting quick verification of this then there is the Russian Navy Website (http://rusnavy.com/nowadays/strength/) or Wikipedia (https://en.wikipedia.org/wiki/List_of_active_Russian_Navy_ships) for those preferring something slightly more straightforward. The following article is part of our cross-posting partnership with Information Dissemination’s Jon Solomon. It is republished here with the author’s permission. Read it in its original form here. Read part one, part two, and part three of this series. How could a U.S. Navy battle force then—or now—avoid defeats at the hands of a highly capable adversary’s deceptions? The first necessary ingredient is distributing multi-phenomenology sensors in a defense’s outer layers. Continuing with the battleforce air defense example, many F-14s were equipped during the 1980s with the AN/AXX-1 Television Camera System (TCS), which enabled daytime visual classification of air contacts from a distance. The Navy’s F-14D inventory later received the AN/AAS-42 Infrared Search and Track system to provide a nighttime standoff-range classification capability that complemented AN/AXX-1. Cued by an AEW aircraft or an Aegis surface combatant, F-14s equipped with these sensors could silently examine bomber-sized radar contacts from 40-60 miles away as meteorologically possible. As it would be virtually impossible for a targeted aircraft to know it was being remotely observed unless it was supported by AEW of its own, and as the targeted aircraft’s only means for visually obscuring itself was to take advantage of weather phenomena as available, F-14s used in this outer layer visual identification role could help determine whether inbound radar contacts were decoys or actual aircraft. If the latter, the sensors could also help the F-14 crews determine whether the foe was carrying ordnance on external hardpoints. This information could then be used by a carrier group’s Air Warfare Commander to decide where and how to employ available CAP resources. It follows that future U.S. Navy outer layer air defenses would benefit greatly from having aircraft equipped with these kinds of sensors distributed to cover likely threat axes at extended ranges from a battle force’s warships. Such aircraft could report their findings to their tactical controllers using highly-directional line-of-sight communications pathways in order to prevent disclosure of the battle force’s location and disposition. Given that the future air threat will not only include maritime bombers but also strike fighters and small unmanned aircraft, it would be enormously useful if each manned aircraft performing the outer layer visual identification role could also control multiple unmanned aircraft in order to extend their collective sensing reach as well as covered volume. This way, the outer layer would be able to investigate widely-dispersed aircraft approaching on multiple axes well before the latter’s sensors and weapons could be employed against the battle force. The same physics that would allow the U.S. Navy to disrupt or exploit an adversary’s multi-phenomenology maritime surveillance and reconnaissance sensors could be wielded by the adversary against a U.S. Navy battleforce’s outer layer sensors, however, so the side that found a way to scout effectively first would likely be the one to attack effectively first. A purely sensor-centric solution, though, is not enough. Recall Tokarev’s comment about making actual attack groups seem to be “easily recognizable decoys.” This could be implemented in many ways, one of which might be to launch readily-discriminated decoys towards a defended battle force from one axis while vectoring a demonstration group to approach from another axis. Upon identifying the decoys, a defender might orient the bulk of his available fighters to confront the demonstration group. This would be a fatal mistake, though, if the main attack group was actually approaching on the first axis from some distance behind the decoys. If there was enough spatial and temporal separation between the two axes, and if fighter resources were firmly committed towards the demonstration group at the time it became apparent that the actual attack would come from the first axis, it might not be possible for the fighters to do much about it. An attacker might alternatively use advanced EW technologies to make the main attack group appear to be decoys, especially when meteorological conditions prevented the CAP’s effective use of electro-optical or infrared sensors. This leads to the second necessary ingredient: conditioning crews psychologically and tactically for the possibility of deception. During peacetime, tactical competence is often viewed as a ‘checklist’ skill set in that crews are expected to quickly execute various immediate actions by rote when they encounter certain tactical stimuli. There’s something to be said for standardized immediate actions, as some simply must be performed instinctively if a unit or group is to avoid taking a hit. Examples of this include setting General Quarters, adjusting a combat system’s configuration and authorized automaticity, launching alert aircraft, making quick situation reports to other units or higher command echelons, and employing evasive maneuvers or certain EW countermeasures. Yet, some discretion may be necessary lest a unit salvo too many defensive missiles against decoys or be enticed to prematurely reveal its location to an attacker. The line separating a fatal delay to act from a delayed yet effective action varies from circumstance to circumstance. A human’s ability to avoid the former is an art built upon his or her deep foundational understanding of naval science and the conditioning effects of regular, intense training. Only through routine exposure to the chaos of combat through training, and only when that training includes the simulated adversary’s use of deception, can crews gradually mentally harden themselves against the disorienting ambiguity or shock that would result from an actual adversary’s use of deception. Likewise, only from experience gained through realistic training can these crews develop tactics that help them and other friendly forces reduce their likelihoods of succumbing to deception, or otherwise increase the possibilities that even if they initially are deceived they can quickly mitigate the effects. It follows that our third ingredient is possessing deep defensive ordnance inventories. A battle force needs to have enough ordnance available—and properly positioned—so that it can fall for a deception and still have some chance at recovering. It is important to point out this ordnance does not just include guns and missiles, but also EW systems and techniques. During the Cold War, a battle force’s defensive reserves consisted of alert fighters waiting on carrier decks to augment the CAP as well as surface combatants’ own interceptor missiles and EW systems. These might be augmented in the future by high-energy lasers used as warship point defense weapon systems, though it is too early to say whether their main ‘kill’ mechanism would be causing an inbound threat’s structural failure or neutralizing its terminal homing sensors. If effective, lasers would be particularly useful for defense against unmanned aircraft swarms or perhaps anti-ship missile types that trade away advanced capabilities for sheer numbers. Regardless of its available defensive ordnance reserves, a battle force’s ability to receive defensive support from other battle forces or even land-based Joint or Combined forces can also be quite helpful. The final ingredients for countering an adversary’s deception efforts are embracing tactical flexibility and seizing the tactical initiative. Using Tokarev’s observations as an example, this can be as simple as constantly changing CAP and AEW cycle duration, refueling periods, station positions, and tactical behaviors. A would-be deceiver needs to understand his target’s doctrine and tactics in order to create a ‘story’ that meshes with the latter’s predispositions while exploiting available vulnerabilities. By increasing the prospective deceiver’s uncertainty regarding what kinds of story elements are necessary to achieve the desired effects, or where vulnerabilities lie that are likely to be available at the time of the planned tactical action, it becomes less likely that a deception attempt will be ‘complete’ enough to work as intended. A more aggressive defensive measure might be to use offensive counter-air sweeps well ahead of a battle force to locate and neutralize the adversary’s scouts and inbound raiders, much as what was envisioned by the U.S. Navy’s 1980s Outer Air Battle concept. The method offering the greatest potential payoff, and not coincidentally the hardest to orchestrate, would be to entice the adversary to waste precious ordnance against a decoy group or expose his raiders to ambush by friendly fighters. All of these concepts force the adversary to react, with the latter two stealing the tactical initiative—and the first effective blow in a battle—from the adversary. In the series finale, we will address some concluding thoughts. Read the series finale here. Jon Solomon is a Senior Systems and Technology Analyst at Systems Planning and Analysis, Inc. in Alexandria, VA. He can be reached at jfsolo107@gmail.com. The views expressed herein are solely those of the author and are presented in his personal capacity on his own initiative. They do not reflect the official positions of Systems Planning and Analysis, Inc. and to the author’s knowledge do not reflect the policies or positions of the U.S. Department of Defense, any U.S. armed service, or any other U.S. Government agency. These views have not been coordinated with, and are not offered in the interest of, Systems Planning and Analysis, Inc. or any of its customers. The following article is part of our cross-posting partnership with Information Dissemination’s Jon Solomon. It is republished here with the author’s permission. It can be read it in its original form here. Read part one and part two of this series. In practice, this entailed extensive use of chaff to clutter and confuse the E-2s’ and surface combatants’ radar pictures, not to mention to create ‘corridors’ for shielding inbound raiders from radar detection. This probably also involved using elements of the sacrificial reconnaissance-attack group mentioned earlier to draw attention away from the other penetrating pathfinders. Most interestingly, Tokarev mentions that the raid’s main attack group included a “demonstration group.” When combined with his statement that only seventy to eighty of the bombers in an air division-strength raid would be carrying missiles, this suggests some of the bombers might have been specifically intended to attract their opponent’s attention and then withdraw from contact—the very definition of a deceptive demonstration (Tokarev, Pg 73, 77). As a Backfire raid would be conducted from perhaps two or three attack axes, a demonstration group could hypothetically cause a significant portion of available CAP resources—not to mention the carrier group’s overall tactical attention—to be focused towards one sector while the main attack would actually come from other sectors. Any missiles launched by the CAP against the demonstration group (or the reconnaissance-attack group for that matter) would obviously no longer be available when the main attack group arrived on scene. In this way, enough of the main group might survive long enough to actually launch their missiles, and maybe longer still to escape homeward. The reconnaissance-attack and demonstration groups might also have been used to induce the carrier group to break out of restrictive EMCON and thereby help clarify the situational picture for the rest of the bombers. Enticing warships to light off their air search radars—and for the pre-Aegis combatants, missile-directing radars—would have provided some high confidence indications of which contacts were surface combatants and which were not. A similar effect might result if the Soviet tactics resulted in U.S. and NATO warships ceasing radio-silence as the carrier group oriented itself to defend against the perceived inbound threat. Still, as the carrier and any carrier-simulating decoy ships present might refrain from radiating telltale radars or engaging in telltale radio communications even under these conditions, the raid’s deceptions would not necessarily help pinpoint the carrier. They would, though, reduce the number of contacts requiring direct visual identification by pathfinders—perhaps dramatically. They would also likely help the raid’s air defense suppression group designate targets for jamming or anti-radar missile attack. None of this should be surprising to those who have read Tom Clancy’s Red Storm Rising. The novel’s famous first battle at sea begins with a Badger group lobbing target drones towards a NATO carrier task force from far outside the latter’s AEW radar coverage. Equipped with ‘radar blip enhancers’ that allow them to simulate bombers, the drones present themselves using a formation and flight profile that easily convinces the task force’s air defenses they are facing an actual raid. 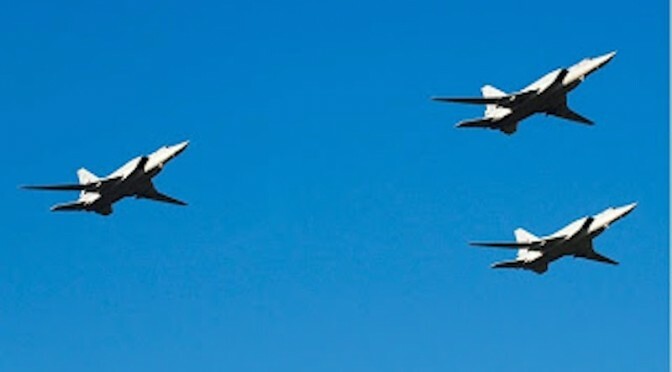 The resultant ruse fools the task force’s F-14 fighters into wasting their AIM-54 Phoenix long-range air-to-air missiles against these decoys, essentially denuding the task force of its outer defensive layer. This is readily exploited by a Backfire group approaching from a different axis, with disastrous consequences for the task force’s warships. Nor should any of this be surprising to students of the first Gulf War. While U.S. Air Force F-117’s were rightly heralded as having penetrated all the way to Baghdad with impunity on Operation Desert Storm’s opening night, their ease in doing so was paved by a joint U.S. Air Force and Navy deception titled SCATHE MEAN. In this little-known mission that closely emulated Clancy’s fictional scenario, the two services launched BQM-74 target drones and ADM-141 Tactical Air Launched Decoys to distract Iraqi Very High Frequency surveillance radar operators from detecting the inbound F-117s, seduce the Iraqis into expending precious Surface to Air Missiles against the bait, and induce these SAM sites into exposing their search and fire control radars to U.S. anti-radar missile attacks. In Part Four, the ingredients for countering such deceptions.